This page are design notes in my search for a suitable 50MHz moonbounce antenna given the available materials. Knowing the properties of the system helps to improve the performance. I have two commercial innovantanna 6el LFA yagi's (boom 6,8m) that will be used. At the end a stack of 4 yagi's will be used, but first the system will consist of two horzontal stacked yagi's. The adding of the two extra yagi's is planned for the near future. The systems can not only be controlled in azimuth and elevation, but also in height. The tower is capable to move the system between 3m and 15m or more above ground level. Besides moonbounce I also want to use this system for my interferometer project. Table 1: Antenna data from Innovantennas, the manufacturer. Simulations are done with nec 4.1 software. The manufacturer recommends 5.8m spacing as a good stacking distance. 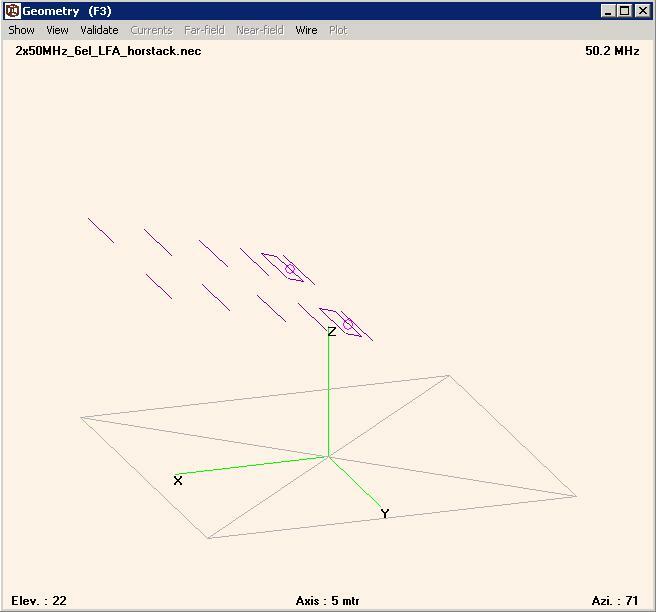 I runned simulations for stacking distance from 3 to 8 meters between the two antennas. I found a good optimum for gain and reasonable sidelob suppression on 5.5 m horizontal stacking distance. This is in accordance with the specifications of the manufacturer. Nice thing is that standard 6m length tubing can be used to build the stack. 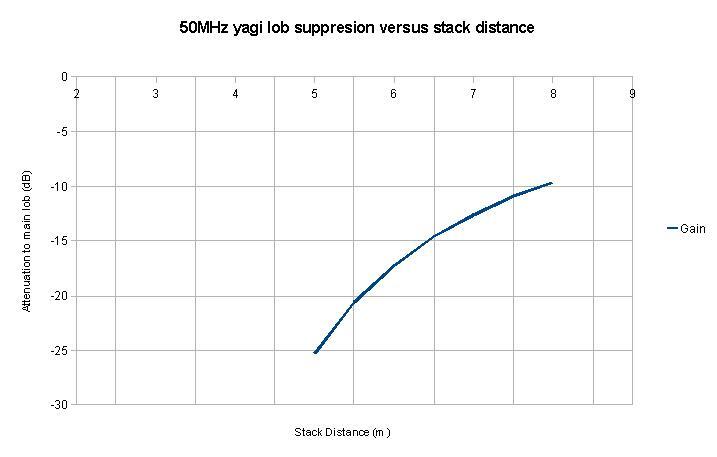 Fig 2: Gain and sidelob suppression as function of the stacking distance. I found that the best gain to the moon will be a function of elevation and antenna height above ground level. 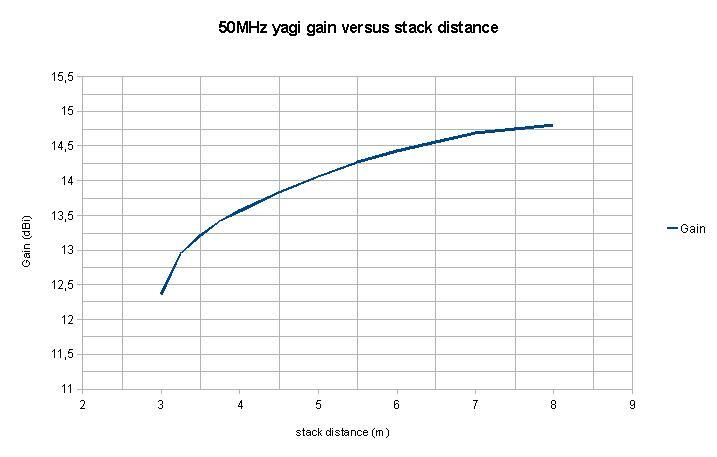 6 meter has a strong ground gain effect, that can be used in the benefit, but can also be against. 5db extra gain from groundgain. 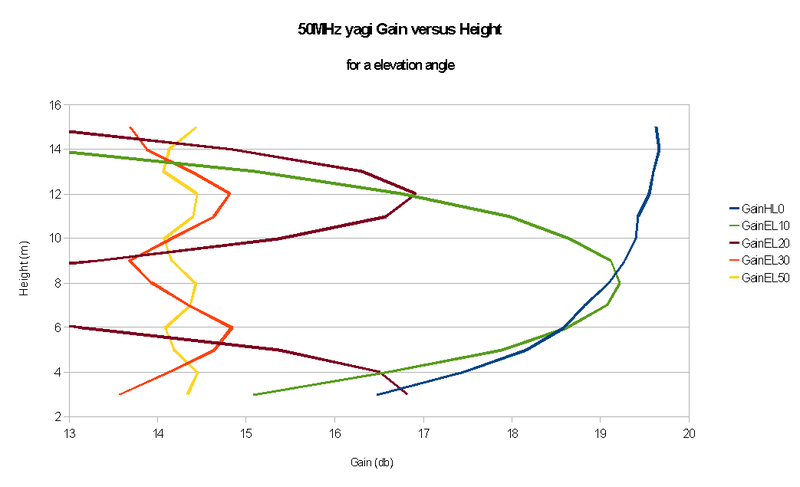 Fig 3: Gain versus antenna height at several antenna elavation angles. Example when the moon is at 10 degrees elevation and the antenna is set at 10 degrees elevation the antenna must be 8 meters above ground. the same for moon and antenna at 30 degrees. The system must be 12 meters above ground to get max gain in that direction. below 10 degrees moon elevation its better to keep the antenna horizontal. The blue line is special. Its not for a fixed elevation but it represents the max groundgain at a antenna height. The pattern elevation will be around 5 degrees at 15 meter to 20 degress at 3 meters agl.